NOT even the scoring flair of Cillian O’Connor could rescue Ballintubber’s hopes of a place in the Connacht club final. No one man could have done more for a team than the haul of 2-3 which the Young Footballer of the Year landed in Sunday’s semi-final at McHale Park. But against a side mentally hardened by the experience of fourteen county titles, and seeking a place in the Connacht final for the third time in four years, Ballintubber looked a shade paler in play and power. Once they got over the initial shock of the Mayo champs’ searing start, Corofin found their natural balance and with guile and muscle dragged themselves out of trouble on more than one occasion to deservedly wrap it up in a one-point win. For a team that trailed by six points in the opening eleven minutes, their recovery was swift and impressive. By half-time not only had they wiped out that lead, they were now four in front, and well in command. Having dominated the opening period Ballintubber’s initial drive died in the following sixteen minutes. O’Connor had reeled in three points before Corofin raised a decent attack. Alan Dillon added another. And just after Alan O’Donovan got the first of his eight points, O’Connor’s magnificent drive almost tore open the net. And that’s where Ballintubber’s dream ended… after eleven minutes. What might have happened if Alan Dillon was more fortunate with a cross from the left wing seconds later that was just too strong for him to turn into the net, we’ll never know. But Corofin took over almost immediately with influential performances by man of the match Daithi Burke at midfield, Gary Delaney, Kieran Fitzgerald and Kieran McGrath in defence and the unwavering accuracy of O’Donovan up front. But it was Galway county star Gary Sice who bored the biggest hole in Ballintubber’s dreams when he grabbed their goal in injury time before the break. Whatever complacency might have surrounded Corofin’s expectations at the interval were banished twelve minutes afterwards with another O’Connor special which wiped out their lead. And for the final fifteen minutes the game was in the melting pot. Even so, Corofin did have the edge in play, and Ballintubber were forced to give away too many frees, grist to the mill of O’Donovan’s unerring foot. But the fight went on gallantly to the end even if all the fine efforts of Alan Dillon, Cathal Hallinan, Myles Kelly, Danny Geraghty and Cillian O’Connor could forge no winning way round an indomitable defence. GALWAY champions Clonbur denied Islandeady their first Connacht junior title in a curtain raiser at McHale Park that was full of passion and honest endeavour. Two points separated them in the end, but with a little more composure around the target, Islandeady could have at least forced the match into extra time. Having faced the wind, the Mayo champions led by a point at the interval. But they benefited nothing from the wind when it did favour them. For Clonbur stepped up the pressure from midfield where Alan Kyne and Eamon Ó Cuív got the edge, and Eoin Joyce punished every indiscretion. The corner forward bagged seven of Clonbur’s eleven points, three from frees, and together with Liam Carney and Pat Lambe caused most problems for the Islandeady defence. The Mayo men lost their shape for a while in the second half, but inspired by the unstinting work of Ollie Feeney, Brian Heraty and Niall McCormack in defence, the scoring power of Danny McGowan, who accounted for five of their nine points, and the efforts of Brian McCormack, Vinny Feeney and Brendan Gibbons up front, they got back on track. When Brendan Gibbons won parity for the fifth time near the finish with a splendid point from the left wing, it came at the end of some wasted opportunities by Islandeady which made the vital difference as Joyce and Pat Lambe went on to grab the winning scores for Clonbur in the dying minutes. THE annual Christmas Green & Red golf outing will be held in Mulranny on Saturday week, November 19. Tee-off is at 9am, so get your name on the list. PADRAIG Carney was the beating heart of the Mayo of the fifties. A man whose football sent the pulse racing in every Mayo follower; a man with whom no footballer could live when he opened up, according to Eamonn Mongey. Carney would have been on the best ever team of those who saw him perform. Seán Purcell of Galway was his contemporary, and considered by most adjudicators to have the edge on the Mayo man. But there is a widespread school of thought that if Carney’s career had not ended at the age of 26, Purcell would have been in the shade. Padraig Carney didn’t hang around to bask long in the adulation reserved for his dual-winning colleagues. But his value as a core member of that great side was evident in the decision of the Mayo GAA Board to fly him home from New York for the National League semi-final of 1954. He was then 26 years of age and concentrating on a post-graduate course at St Clare’s Hospital, New York. Unlike modern air travel, a plane journey from New York then could take up to fourteen hours. But the trip knocked no feather from the burly Carney who played a key role in defeating Dublin, scoring seven of Mayo’s total of eleven points. Dubbed the ‘flying doctor’, the Swinford man was flown home again for the league final and duly collected his last medal with his native county. In all he lined out on thirty occasions for Mayo and scored 8-99. Compare that with his namesake Martin Carney who played on 101 occasions with Mayo and scored 10-150, having already won an Ulster medal with his native Donegal. 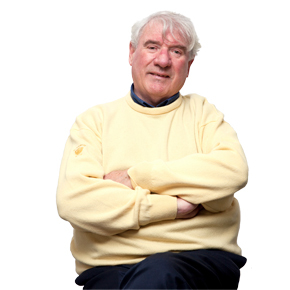 Padraig, who played minor in 1946, entered UCD the previous year and was immediately drafted into the Sigerson Cup team which he helped to victory on three occasions. His first appearance in a Mayo senior jersey was in a challenge in 1945, and while a minor he played senior championship with county the following year when Mayo were beaten in the Connacht final replay by Roscommon. Having added his signature to the famous letter to the county board, he won the first of his four Connacht senior medals in 1948. And he holds the record as the first player to score a goal from a penalty in an All-Ireland final… against Cavan in 1948. In addition to his two senior All-Irelands, Carney played for Connacht in the Railway Cup six times, and was on one winning side — in 1951. He was also on the combined universities for three years against the rest of Ireland. The two competitions were then prestigious events. He togged out for five different clubs, including Castlebar Mitchels with whom he won two county senior titles. All of that before he was 26 years of age.